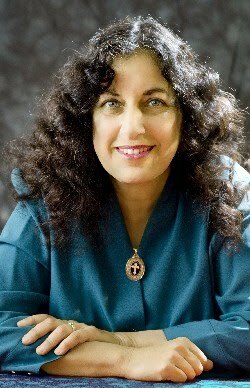 Margarita Engle in a multi-award winning author and poet. 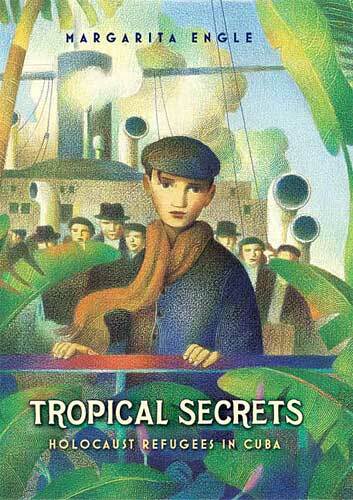 Her novel-in-verse, Tropical Secrets (Henry Holt) was honored with the Sydney Taylor Book Award for Teen readers. The unusual topic of the plight of Holocaust refugees is told from the perspective of several characters, each with a distinct voice. Engle’s evocative language in this beautifully crafted story. The main character, Daniel, is a young refugee who hopes to find his parents, but his sense of despair and loneliness as he arrives in Cuba is overwhelming. This breathtaking book pays homage to refugees of Cuba and those who supported them. Not only will readers learn about a little discussed historical event, they will fully engage in a beautifully told story whose characters resonate long after the last page is read. Margarita spoke passionately about her work when accepting her award at the Association of Jewish Libraries Convention. I'm delighted to share her thoughts about writing Tropical Secrets. What inspired you to write Tropical Secrets? I was moved by the image of refugee children traveling alone, without knowing what to expect. During the late 1930s, when German ships filled with Jewish refugees were turned away from New York and Toronto, they anchored in Havana Harbor. Despite turmoil and tragedy, most of the refugees were granted asylum. Cuban teenagers and American Quakers volunteered to teach them Spanish. I visualized music as common ground for young people who cannot yet speak the same language. My personal connection to the story is found in my own family history. My father is an American artist of Ukrainian-Jewish ancestry. He traveled to Cuba after seeing National Geographic photos of my Cuban-Catholic mother's hometown, Trinidad de Cuba. They met on Valentine's Day, 1947, at a colonial palace in Trinidad that was being used as an art school (It is now El Museo Romántico, the Museum of Romantic Art., and the entire town of Trinidad, Cuba, is now a UNESCO World Heritage Site.) Even though my parents could not speak the same language, they passed drawings back and forth to communicate. Sixty-two years later, they are still married, despite all the differences in their cultural and religious backgrounds. Love conquers all! How did you learn about the history of Jewish refugees in Cuba? A long time ago, I read about the St. Louis, a ship that, tragically, did not receive asylum. It was turned away from Cuba, and returned to Europe. Many of those refugees perished in concentration camps. Years later, Tropical Diaspora, a nonfiction study by Robert M. Levine, gave me a better understanding of that era in Cuba. I felt haunted by the image of a safe harbor, and the kindness of strangers. I chose to use fictional characters to depict a real historical period. I chose free verse because it allows me to distill complex situations down to their emotional essence. I also used free verse because it offers an uncrowded page, and I hoped that would be inviting to reluctant readers. I also hoped it would be inviting to family literacy programs, where the combination of fast, easy reading and a mature theme might be suitable for various ages. Tell me a bit about the research required for writing the book. Unlike my books set in earlier centuries, there was little need to dig through archives. Tropical Diaspora, along with the references listed in that volume's bibliography, provided abundant details, so for me, the real work was simply imagining. That's not as easy as it sounds. The early drafts had emotional gaps that were noticed by my perceptive editor, Reka Simonsen. She edited the manuscript very gently, by asking questions. How did this character feel when such-and-such happened? What were his memories? How did he suffer, even though he was a survivor? I realized that I had tried to protect my young characters from suffering. In some ways Tropical Secrets is a joyful story with a hopeful ending, but the element of pain and loss cannot be omitted. So for me, the real research was suffering along with my characters, by imagining their experiences. In the process of your research did you learn anything that surprised you? I was shocked to learn that Nazi spies had been sent to Cuba to stir up anti-Semitism, in a deliberate attempt to insure that refugee ships would be turned away. I was also amazed to learn that after the bombing of Pearl Harbor by Japan, Cuba rounded up and imprisoned non-Jewish Germans on the island. This meant that the red J on a German Jew's passport suddenly served as protection against arrest. It seems like one of the clearest 'there-but-for-fortune' lessons anywhere in history, demonstrating how easily anyone can become a target, and how easily targets can change overnight, once the doors of hatred and fear are opened. How did you feel when you learned that Tropical Secrets won the Sydney Taylor Book Award for Teen Readers? Margarita, congratulations on your STBA award! Thank you for sharing your fascinating writer's journey with us. I have just returned from the Association of Jewish Libraries Convention in Seattle. One of the highlights of the convention is honoring the winners of the Sydney Taylor Book Award. Robin Friedman is the winner of the Gold Medal for Older Readers. 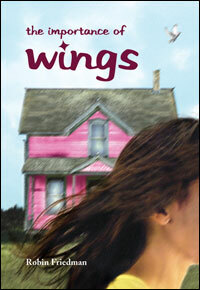 Her book, The Importance of Wings (Charlesbridge Publishing) is an engaging story of two sisters, Roxanne and Gayle. Their family has immigrated to Staten Island from Israel. Set in the 1980’s, the story offers a nostalgic slice of life for middle grade readers, and sheds light on the unique Israeli-American experience. 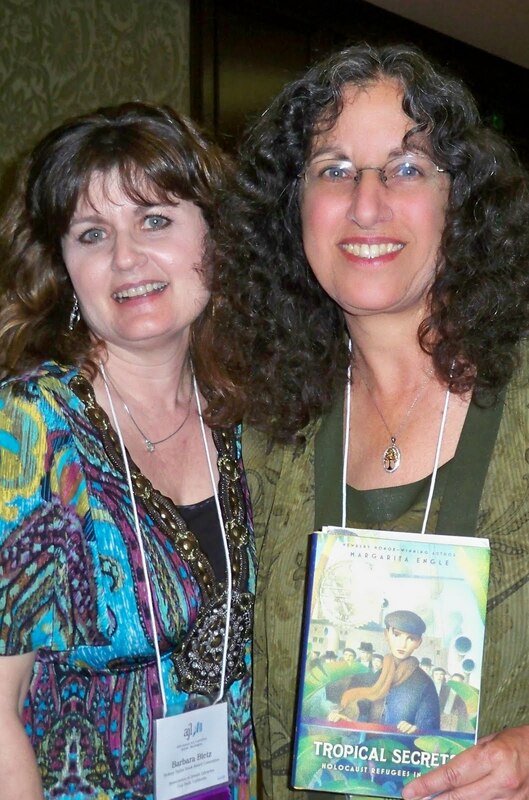 Robin is currently the special projects editor at the New Jersey Jewish News, and is the author of five books for young readers, including The Importance of Wings. Her young adult novel, Nothing was a 2009 Sydney Taylor Notable Book for Teens. I thoroughly enjoyed The Importance of Wings and was excited to learn more about the story from Robin. How autobiographical is The Importance of Wings? Very autobiographical! I really did grow up on Staten Island in the 1980s. I have a younger sister; I hated gym, watched too much TV, and couldn’t get my hair to form wings. What was the fiction part? The Cursed House next door, Liat, and my mother spending time in Israel caring for a sister. Some of the scenes, however, such as playing with Legos in the basement, going to town to buy spice cakes, and trick-or-treating at Halloween dressed as cats are directly lifted from my childhood. I have to say, it’s both enjoyable and terrifying to write that intimately. I have new respect for authors who write memoirs! Have you heard from other Israelis that the experiences of Roxanne, Gayle, and Liat mirror their own? Yes, especially the feeling-like-an-outsider part, which I’m sure resonates with many immigrants. Being poor, having parents who speak with thick accents, and not being familiar with American traditions are other common experiences. Being from another country has made me very, very grateful for America, another common immigrant experience. Every Fourth of July, for example, I read the Declaration of Independence aloud, in its entirety, to my friends at our annual gathering. I majored in American history in college, and especially love anything having to do with the Revolutionary era. Tell me a little bit about the haunted house in the story. Do you have any experiences with haunted houses? The idea for the Cursed House actually came from listening to friends at a dinner party describe a house next door to them where strange events always seemed to be happening, including a night visit by armed FBI agents (which I used in my first chapter). I carry a little notebook in my purse where I jot down ideas that I come across, and I remember writing “Cursed House” in my notebook that evening. What's the best part about being an author of children's books? The best part about being an author of children's books is the opportunity to share stories with kids who love books. This audience has impeccable taste, and I firmly believe that creating a good book for a child is much more demanding than creating one for an adult. Adults tend to settle for what is okay; kids hold out for something that captures them. Pleasing them is not only a worthy goal, but a humbling challenge. Robin, thanks for inspiring readers (through your books and for reading the Declaration of Independence!) and congratulations on the success of The Importance of Wings.